I made it to the end of the school year 2011. It's been a couple of years since I've completed a WHOLE year so this is a major accomplishment. One person that's helped me attempt to keep my sanity is my lunch buddy. That's her to the right, no - that's the left: Kim Holmes. She's been great to talk to and listen to - well, maybe listen to mostly because she's an awesome talker and I'm a pretty good listener so we're a good combination. I had a favorite study hall: 7/8. We worked super hard every day, contrary to ummm... never mind:) I'm really going to miss that group of kids. That's the crazy bunch minus one (that's them to the right. See? I really do know my right's and left's) The girls would group around my desk and I would multi-task to help them with their homework. That's my desk that they're around in the picture, actually. If you can picture four girls hovering around me vying for my attention - then you can imagine my Mondays through Fridays. Tomorrow starts finals. Ahhhhh.... I am sooo glad the year is about over. That's what's so great about my job. I get to work with really super teens and then I get to be away from them for a whole glorious summer and I'm always ready to see them again when summer's over. I'm very thankful for the kids I work with and I pray that God will keep them safe this summer until we come back together again next school year. That's my prayer. Please God, help them make good choices and keep them safe. The storms of life have hit me again. It wasn't totally unexpected but I was trying not to live with that fear. So here I am, trying not to feel defeated... abandoned...lost... lonely...lied to. Easter Sunday, our choir sang this song and it came to me again when I sat down just now: Praise the Lord, by the Imperials, one of my favorites when I was a teenager. I can fight God or I can praise Him. I'm not sure I'm quite ready to praise just yet but the little bits of the wall are coming down. Here are the lyrics. They resonate in my spirit right now and maybe they will in yours, too. I'll be ready for the fight again, sometime...maybe, but right now, I hope others will pray for me. I'm tired of the fight. Too tired... Maybe God's telling me to just praise Him right now. Maybe? Here's a start: Thank You, God for...ummm... well, just Thank You, God. Okay...now I have some praises: Friends who are praying and telling me:) and after I posted this blog in faith and obedience, my FB suddenly started working. That's just wild. It hasn't been letting me post comments on statuses or write PM messages. If that isn't a God-thing, I don't know what is. Thank You God for these things. And thank You for my laptop and internet that connects me to my praying friends. And Thank You for my husband who has a birthday today. Chinks are falling down little by little but the problem is still there. Majorly still there. and I want to cry. am crying but I will praise the Lord through the tears. Thank you for praying for Katalina. Go to Lisa's blog to see an answer to all of our prayers! 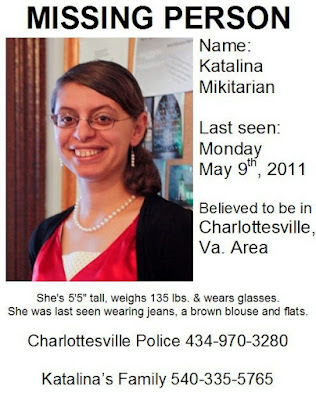 Our daughter, Katalina, has been missing since Monday, May 9, 2011. She was in a program in Richmond, Virginia. She broke their rules, and when it was discovered was dropped off at the Richmond Greyhound Station with $1.58 in her pocket and a voucher for a bus ticket to Charlottesville, VA--the station closest to home. She had no cell phone. It was 7:30 at night. The program counselor left a message on our phone at about 7 to call her. We didn't get home from work/meetings until after 8:30 PM. By the time we were able to send someone to the station for us (we live 3+ hours away), Katalina was gone. We were unsure for several days whether she had even boarded the bus to C'ville or not, as she was emotional and unsure she even wanted to come home. On Thursday surveillance tapes showed she had boarded the bus--which meant she intended to come home--but because the program hadn't made contact with us, there was no one there to meet her. Did she meet someone on the bus? What did she think when she got off and didn't see her parents waiting for her? Where is she? Is she safe? How could they drop our daughter off at a bus station at night with no money and send her to a place where she knows no one? These are the questions that plague us. The Charlottesville Police Department is doing everything it can to find her. Any help you can provide through prayer or the sharing of this page would be truly appreciated. If you see her, please tell her that her family loves her, is worried and just wants to know she is all right. Please tell her to call home. Katalina has short brown hair and brown eyes. She's 5'5" tall and weighs 135 lbs. She wears glasses. She was last seen wearing jeans, a brown blouse and flats. Today is our anniversary. 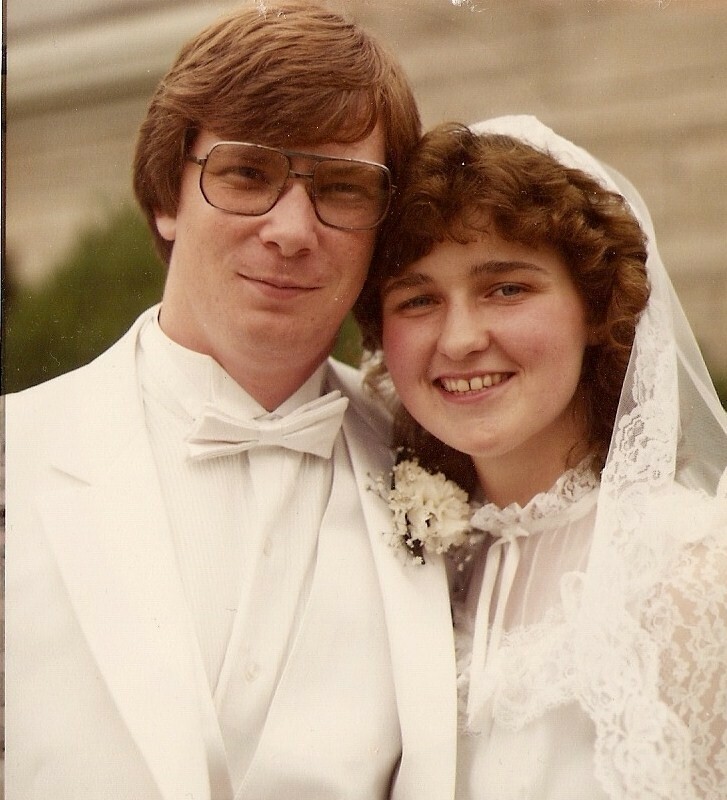 On May 14, 1983, Jim and I were married. We've lived in Tabor (Waynesville, Illinois) all of those twenty-eight years. Tabor, for anyone that doesn't know, consists of a grain elevator, feed mill, two houses, and... that's it:) It really doesn't even show up as Tabor on GPS, by the way. We've had three kids. Ryan now lives in Pingree Grove, Illinois where he is a Navy Recruiter. Kristen lives in Vandalia, Illinois where she works in group homes standing up for those who can't stand up for themselves. I pity the ones who try to cross her! Nik has just turned eighteen and will be graduating soon and going off to college. Sooo...very soon we will be empty-nester's. That will be a new thing for us but I think we will catch on very quickly and enjoy it. In our twenty-eight years, it hasn't been easy. 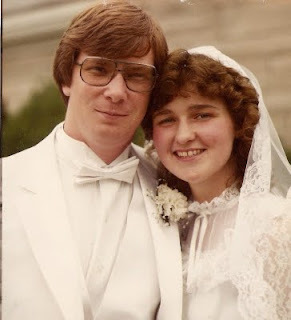 We've had births, deaths, joys, sadness, weeping, and laughter, but we are in our marriage for the long haul. Together we will make it through whatever life throws at us. We also share an anniversary with our good friends Kent and Laurie Retzer:) So that is very fun and unusual! 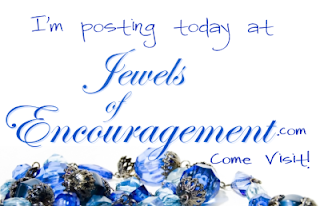 Please press the button above and it will whisk you on over to the Jewels of Encouragement Blog where Jan Dial is guest posting! You won't want to miss it, trust me:) She's sharing what's she's learned from people in her life living in the 'Golden Years.' Happy Lord's Day! Looks like another day of sunshine and maybe with NO wind!